Majestic mountain views,amazing sightseeing opportunities and legendary runs. This secret recipe have made the ski areas surrounding the great Lake Tahoe a prefered ski holiday destination for decades. An increased tourist influence and top class hotels built during the recent decade, bears testimony to this fact. Afterall, when all is said an done, it is difficult not to fall in love with this fantastic place. With an average of 290 days of sun per year, combined with astonishing nature, the prices for spending your ski holiday in any of Lake Tahoe ski areas, has consequently gone up. The average price tag for an overnight stay in the high season at Alpine Meadows could be found for 100$ just 5 years. Should you find an upscale hotel below 200$ nowadays one should probably consider oneself lucky. The lack of urban development in Lake Tahoe over recent years, have understandably had some influence on the housing market. Unlike many of the usual alpine satelit cities, who build to accomodate what influx of visitors may come, the cities surrounding Lake Tahoe are much more cautious. This is mainly due to reservation issue and thereby following legislation. As a consequence the supply of rental propoerties have not followed demand, which have yielded increased housing cost and subsequently spikes in rental prices. In the combined Lake Tahoe ski area, you will find an endless stream of ski resorts full of adventure, fun, food and excitement. There are nearly 18 ski resorts, as close as 20 km and as far as 150 km from the Reno-Tahoe international airport. All ski resorts in and around Lake Tahoe are located within a short drive, thus making them perfect for those who want to enjoy skiing and snowboarding in the morning, sight-seeing and escapade in the late afternoon and followed by non-stop entertainment and nightlife in evening. Here are some of the Lake Tahoe ski resorts in and around Lake Tahoe that have long maintained the reputation of being the best, and are considered the best in the business. Located in Placer County, California in the Northwest shore of Lake Tahoe, Northstar California is a mountain resort nearest to Truckee city which is famous for its breath-taking mountain vistas and amazing skiing runs. It provides a unique experience, coupled with high-end, on-mountain elation with a sophisticated Alpine-style village-like atmosphere. It wouldn’t be wrong to say that this place is an absolute heaven for modern families and individuals as they will find upscale shops, five-star slope-side lodgings, refined dinning options, world-class terrain parks and more. 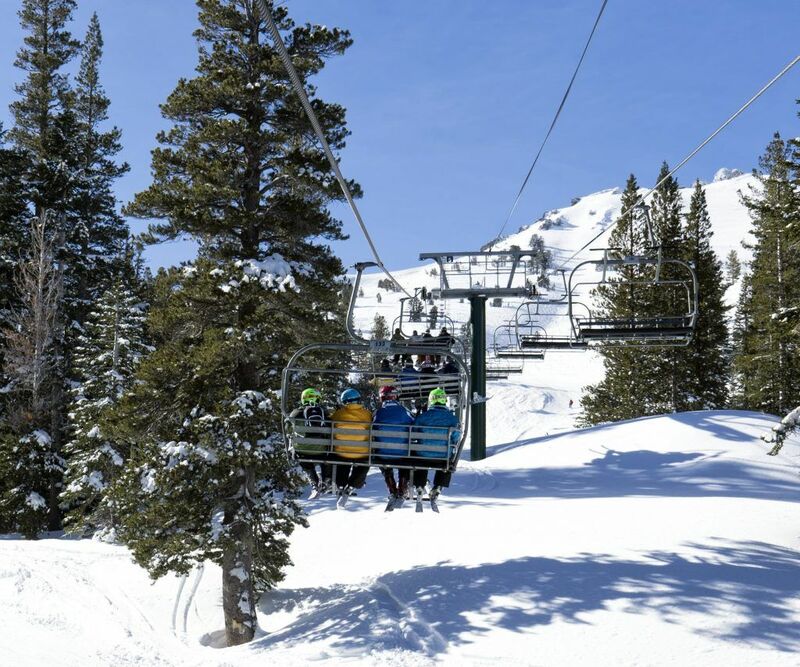 As far as the skiing information in concerned, this resort is one of those Lake Tahoe ski resorts that features 3170 acres skiable area, a top elevation of 8610 feet (2620m), base elevation of 6330 feet (1930m), and a vertical drop of 2280 feet (690m). It has a total of 100 runs with 13% beginner, 60% intermediate, and 27% advanced and has a longest run of 1.4 miles (2.3km). There are 20 lifts, which take skiers and snowboarders back to where they can kick off their ski run. Located in Twin Bridges, South of Lake Tahoe, Sierra-at-Tahoe is a skiing and snowboarding paradise for intermediate and advanced-level skiers and winter snow enthusiasts. This resort is 12 miles south of Lake Tahoe and 16 miles south of Stateline Nevada. Sierra as its short name suggests, is one of the Lake Tahoe ski resorts that has significantly grown in role as one of the Lake Tahoe’s largest, and most visited resort that offers incredible ski runs for all levels. This resort has a skiable area of 200 acres, top elevation of 8852 feet (2696m), base elevation of 6640 feet (2020m) and a vertical drop of 2212 feet (2699m). It has 46 total ski runs where 25% runs are meant for beginners, 50% for intermediate, and 25% for advanced/professional skiers and snowboarders. Also, it has a very famous Sugar ‘n’ Spice longest run of 2.5 miles (4km) and an advanced lift system, consisting of 11 lifts. As far as the terrain parks are concerned, it has a total of 6 parks; The Alley, Burton Progression, Bashful, Upper Snowshoe, Aspen and Smokey Boarder X. Sierra is one of the Lake Tahoe ski resorts where you can also refuel yourself with many dining options located at various points with your loved one after a tiring day on the slopes. Solstice Eatery, Baja Grill, 360 Smokehouse BBQ, Sierra Pub, the Aspen café, and Mama’s kitchen are some of the famous eateries in and around Sierra ski resort. Known for having great snow and elevated views of the High-Sierra and Lake Tahoe, Alpine Meadow ski resort is located in Bear Creek, which is an unincorporated community in Placer County, California. 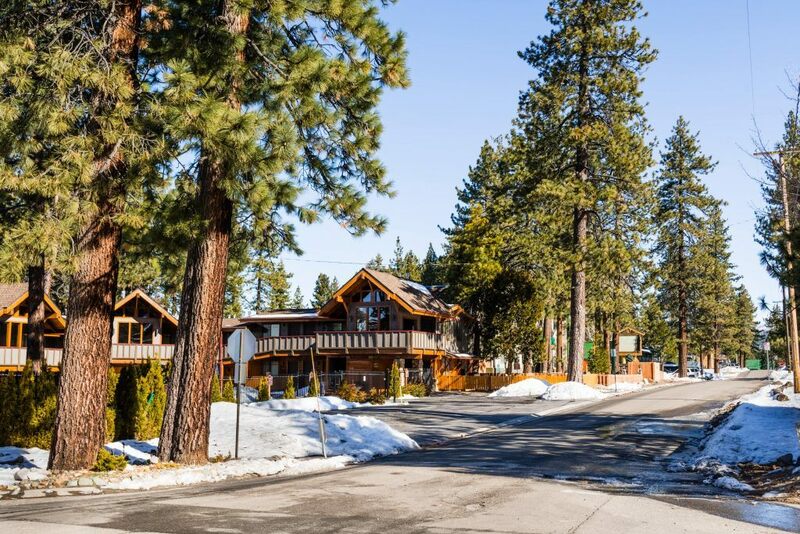 The community is located just 5 miles west of Tahoe City. This family-oriented ski resort offers a unique skiing experience in a laid-back environment where you tend to enjoy the most with your loved ones. This resort is one of those Lake Tahoe ski resorts that has something for everybody, including ski runs for all levels, which is the main reason why skiers and snowboarders keep coming back from time to time. It has a total of 2400 acres skiable area and six-passenger high-speed chair lift. Located in Olympic Valley, California, Squaw Valley Ski resort has the second largest ski area in Lake Tahoe after Heavenly ski resort. This resort primarily came into the limelight when it hosted the entire 1960 Winter Olympics. Since then, it has turned into a legendry vacation destination surfaced at the end of a gorgeous Sierra Valley. It’s perfect terrains and deep powder snow make it ideal option for skiers and snowboarders of all levels. From most advanced terrains on the west coast for professionals to ski resorts that provide lessons for beginners and people of all levels, Squaw Valley is an absolute heaven for everyone. With 4000 acres skiable area, its slopes cover a wide range of terrains, including off-piste runs for professional and advanced skiers and snowboarders. It has a top and base elevation of 9050 feet (2760m) and 6200 feet (1890m) respectively and vertical drop of 2850 feet (870m). It has a staggering 177+ runs with nearly 85% advanced and professional ski runs and a longest run of 3.2 miles (5.1km). As far as the lift of this one of the largest Lake Tahoe ski resorts is concerned, it has a total of 30 lifts that have the capacity to carry 58000 persons per hour to and around the resort. Located in the Placer County near Norden, California, Sugar Bowl ski resort is a medium-sized ski resort well known for its history, deep powder mountains, high annual snowfall, advanced-level terrains, and being one of the closest ski areas to Sacramento and the San Francisco Bay Area. Modern families prioritize to visit this resort as it offers a terrain to challenge experts, and accommodate beginners. Also, it offers a super-classic skiing atmosphere, along with providing all modern amenities which one can think off. Being one of the largest Lake Tahoe ski resorts, it has a total of 1650 acres skiable area, 103 runs for all levels, 16 lifts and a longest run of 3 miles (4.8km). It has a top and base elevation of 8386 feet (2555m), and 6883 feet (2098m) respectively. Located in Incline Village, Nevada in the western United States, Diamond Peal ski resort is as beautiful as any other high-end luxury resort in the entire world. It is famous for hosting local winter events and group activities, which is why people in groups prioritize to visit this resort. This resort has a skiable area of around 655 acres with a top elevation of 8540 feet (2603m) and base elevation of 6700 feet (2042m) and a vertical drop of 1840 feet (561m). It has a total of 30 runs with the longest run comprising of 2.5 miles (4km), including a network of 6 lifts. Located on Nevada-California border in South Lake Tahoe, Heavenly Mountain ski resort is one of the best, and by size, the largest Lake Tahoe ski resorts. First-time tourists and holidaymakers visiting this resort are known for becoming absolute fans of Heavenly’s scenic beauty and specular mountain terrains. The buzz of being the best ski resort in Lake Tahoe has driven people from all across the globe to visit this beautiful ski resort. The views of Sierra Nevada Mountains and Lake Tahoe are magnificent. As for the resort’s skiing information is concerned, it has an enormous 4800 acres skiable area, a total of 97 ski runs of all levels including beginner, intermediate, and advanced skiers and snowboarders, longest run of 5.5 miles (8.9km) and a lift system and network of 30 lifts of all nature, including fast-moving passenger magic carpets, high-speed aerial tram and lifts. Located at a mammoth height, Heavenly mountain ski resort is one of the Lake Tahoe ski resorts that has a top elevation of 10,067 feet (3068m), base elevation of 6255 feet (1907m), and a vertical drop of 3812 feet (1,162m). This resort is certainly a heaven for advanced skiers and snowboarders, looking to experience skiing like nowhere else.